It’s exactly 30 years since the Detroit Auto Show became the North American International Auto Show. With the support of the ‘Big Three’ – Chrysler, Ford & GM – the formerly dealer-run, regional show emerged on the radar of the global auto industry. Subsequently, the industry would meet in Detroit to ring in each new year and set the mood for the next twelve months. This was a specific privilege of the Detroit show, and it won’t happen again as the show is being moved to the summer starting next year. This is an attempt to counter the slow descent that has put this show far behind the Frankfurt and Geneva motor shows in recent years. In 2019, for the final time, the industry met in January at Cobo Hall in Detroit. But the first trade show of the year had already taken place – CES in Las Vegas, with a focus on electronics and telematics. The German manufacturers, with the exception of VW, have turned their back on the Detroit auto show. Whether they will come back in June 2020 is far from certain. But the Japanese, Koreans and Americans have remained faithful – and the signals they sent out in Detroit were sometimes diametrically opposed to the messaging that came out of CES. In Las Vegas, where ‘tech bloggers’ and visionaries dominate, electric mobility and autonomous vehicles are taken as a given. CES is asking – what’s next, and how will we entertain ourselves in these autonomous, electric capsules? But, alas, there was unexpected disturbance this year as Toyota stated that we should not expect autonomous vehicles on a large scale anytime soon. Once more, Toyota told the truth, but the tech writers were livid. And they would have been in for a mighty shock had they bothered to travel to Detroit. Toyota’s straight talk was nothing compared to the provocations that came in the form of the machines that were on the show floor this year – they couldn’t have been bigger and more powerful if they had tried! 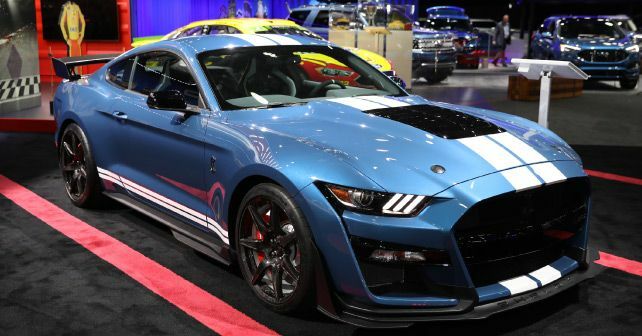 Ford brought the ultra-powerful Mustang Shelby GT 500, putting out over 700 horses. And FCA unveiled the Ram Heavy Duty pickup, fitted with a base 6.4 litre V8 petrol motor and an optional 6.7 litre six-cylinder turbodiesel, producing 400bhp and a record-breaking 1,358Nm of torque. The segment of large SUV continues to grow – Cadillac showed the slightly disappointing XT6, Kia unveiled the awesome Telluride and Ford brought a new Explorer. What do all of them have in common? Well, three rows of seats and powerful engines. They all make around 300bhp – except for the 400-hp Ford Explorer ST. The Japanese also put performance first. Lexus unveiled the LC as a convertible concept and an updated RC F, both powered by a naturally aspirated V8. Toyota took to the floor with the long awaited Supra, a rear-wheel drive sports car developed in partnership with BMW. And Subaru unveiled the Impreza STi S209 with a 340bhp boxer engine. Hyundai’s luxury brand Genesis didn’t show a new car, but it claimed a prestigious award – 54 jurors from the USA and Canada chose the sporty Genesis G70 as North American Car of the Year. In 2020, this promising BMW 3 Series competitor will likely be offered globally. VW CEO Herbert Diess arrived with 800 million USD in his proverbial suitcase. This money will be invested in the Chattanooga / Tennessee plant for the production of electric cars. VW thinks that e-mobility in the US will take off sharply in the coming years. But this question remains unanswered. Modern combustion engines are extremely clean, and fuel prices in the US have dropped to below 50 cents per litre. Moreover, the government wants to cut subsidies for electric cars. No wonder Tesla didn’t bother to show up at Detroit.